Absolute return funds generally seek to generate a specified return over a given period. This can be an amount over a rate of interest, such as LIBOR, or an inflation metric. AR funds form a very broad church indeed and require considerable research analysis prior to investing. Absolute return (AR) funds generally seek to generate a specified return over a given period. This can be an amount over a rate of interest, such as LIBOR, or an inflation metric. Often, the given period is stated as three years, but terms can be less transparent, such as "market cycle" or another loosely defined rolling period. They may also have complex derivatives, currency and alternatives positions, as well as short exposures. AR funds form a very broad church indeed and require considerable research analysis prior to investing. According to Lipper data, estimated net flows (ENFs) into AR funds (defined as funds in the Lipper Absolute Return GBP classifications) peaked at slightly more than £12 billion at the end of 2015. By the end of 2018, the tide had turned almost completely, with these same funds returning -£9.4 billion in ENF. There has been ENF of some -£5 billion in Q1 2019 alone, a sign which doesn't augur well for the rest of the year. Exhibit 1. below reveals that recent performance of AR products in aggregate has been challenging and very likely the main driver for the huge outflows outlined above. 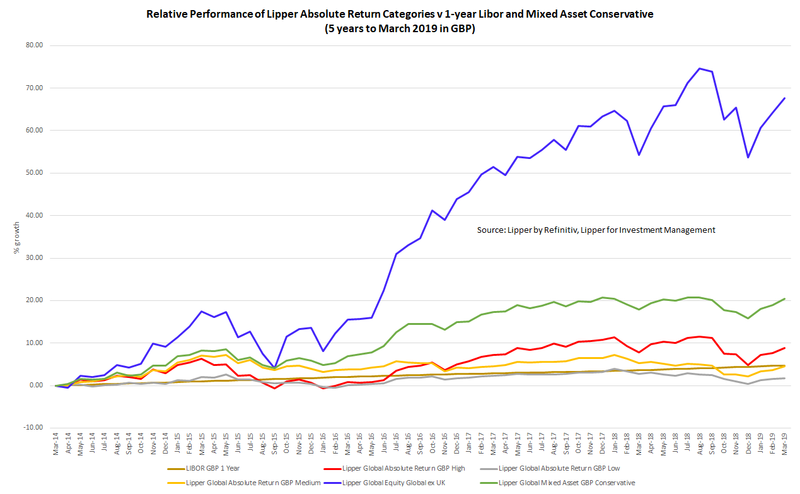 In what is a damning performance outcome, for the five years to the end of December 2018, one-year LIBOR had bettered or equalled the three Lipper AR categories in this analysis. Source: Lipper by Refinitiv. Lipper for Investment Management. Past performance does not indicate future performance. Over that same period, of the 362 funds with a five-year performance history, 122 experienced a negative return. That is more than a third of funds experiencing a loss of capital over five years. What is behind the AR headwinds? Potentially, AR funds face a crisis of investor confidence at two ends. Firstly, where equity markets are very buoyant-such as in 2016 and 2017 - lower volatility is not as attractive when investors in a single strategy equity fund, for example, are participating fully in a rally. Secondly, when market returns are negative and AR fund returns are also negative, there is the perception that AR funds are not performing as intended. This was largely the situation in 2018, where correlation across all assets was high and the benefits of asset diversification and more complex strategies less evident. Source: Lipper by Refinitiv, Lipper for Investment Management. Arguably, we have experienced three years of markets which might not have been most conducive for AR funds. This shouldn't come as a great surprise. We are in a period of unprecedented market distortion where typical assumptions about the "cycle" are more difficult to evaluate. 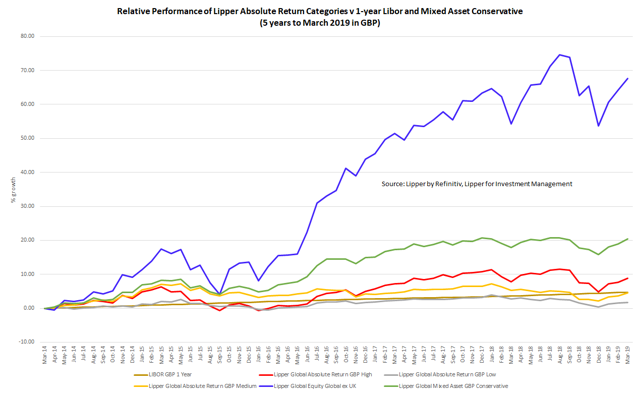 However, that will be of little comfort to investors who witnessed the Lipper Global Mixed Asset GBP Conservative classification outperform considerably over the last five years with a comparable risk profile. See Exhibit 2. above. 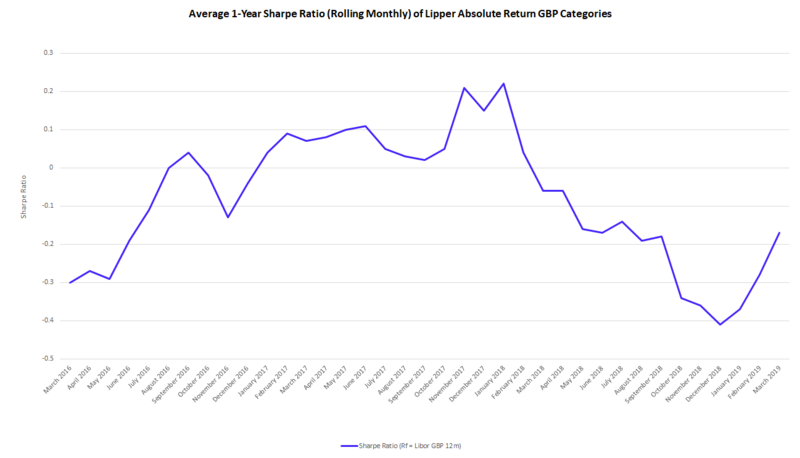 Looking at a simple Sharpe ratio metric (the average one-year Sharpe ratio [rolling monthly] of all the funds in the Lipper AR GBP categories) - with one-year LIBOR as the risk-free rate - reveals the decline of fund manager ability to outperform over the last five years. See Exhibit 3. below. Exhibit 3. 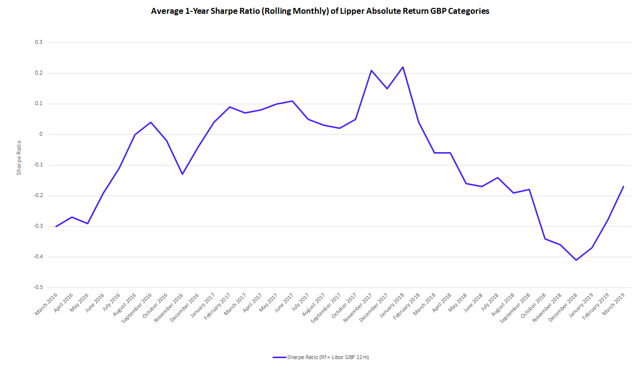 Average One-Year Sharpe Ratio (rolling monthly) of Funds in Lipper AR GBP Categories. Source: Lipper by Refinitiv. Lipper for Investment Management. In aggregate, AR funds have only experienced positive Sharpe ratios from the start of 2017 to the first quarter of 2018. It is difficult to infer much from short-term performance. However, the first quarter of 2019 has seen a brighter start for AR funds in the UK from a performance, rather than a fund flow, perspective. There has been a material uptick in the rolling Sharpe ratios, and the average return of AR funds for the period has been 2.1%. Additionally, only 10% of all AR funds have returned a negative amount over the quarter. It will undoubtedly require a sustained improvement in the fortunes of AR funds before investors return in large numbers. However, for many investors attracted to the "concept" of absolute returns, a rising tide may not be enough to encourage another swim.